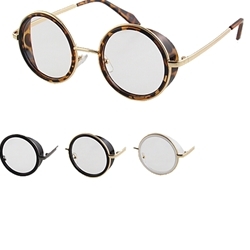 The Clear Steampunk Glasses are a round frame pair of glasses. These glasses are excellent to pair with other steampunk accessories, whether you want to dress as a specific character or create a unique steampunk outfit. Includes on pair of glasses with color of frames are assorted. A great item for the Wonkavision scene in Willy Wonka and the Chocolate Factory.